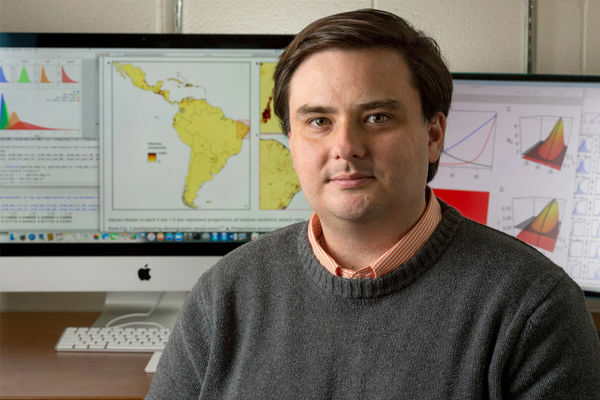 Researchers at the University of Notre Dame used mathematical modeling to quantify what fraction of dengue virus infections might be caused by people whose illnesses were undetected by public health surveillance systems. Their work involved integrating data sets on the amount of virus in the blood during various stages of infection, severity of symptoms in relation to previous infections, and what proportion of infections result in clinical consultation. The World Health Organization currently focuses disease surveillance efforts on detecting outbreaks, monitoring trends in the number of cases, and assessing the possibility of outbreaks. This surveillance encompasses the monitoring of suspected and confirmed dengue cases. The lead author on the study is Quirine ten Bosch, a former biological sciences doctoral student and graduate fellow of the Eck Institute for Global Health at Notre Dame. She is currently a postdoctoral scholar at Institut Pasteur in Paris, France. Perkins and ten Bosch are affiliated members of the Eck Institute for Global Health. Other collaborators on the study include Benjamin M. Althouse, Institute for Disease Modeling; Philippe Buchy, GlaxoKlineSmith; Hannah E. Clapham, Oxford University Clinical Research Unit; Veasna Duong, Institut Pasteur du Cambodge; Uriel Kitron, Emory University; Louis Lambrechts, Institut Pasteur; Alun L. Lloyd, North Carolina State University; Amy C. Morrison, University of California, Davis; Gonzalo M. Vazquez-Prokopec, Emory University; Thomas W. Scott, University of California, Davis, and Lance A. Waller, Emory University. The National Institute of Allergy and Infectious Disease at the National Institutes of Health funded the study with a grant to the University of California Davis (1P01AI098670-01A1). Originally published by Brandi Klingerman at research.nd.edu on May 04, 2018.